I am so sad to hear of the death of Liam Neeson’s wife and mother of two children, actress Natasha Richardson. She comes from a “royal” family of wonderful actors. I thought she might be an Sag with Aries moon, but no. Mars in Leo is very involved in dramatic exhibitions, and Sun/Mercury in Taurus is lovely for voice and movement. Venus in Aries – this lady did not hold back on her favor or irritation. Saturn in Aquarius meant a considerable struggle to remain aloof and focussed on the group benefit rather than personal creativity. But I feel that her North Node in Cancer meant she always focussed on home not career. Aries rule the head. 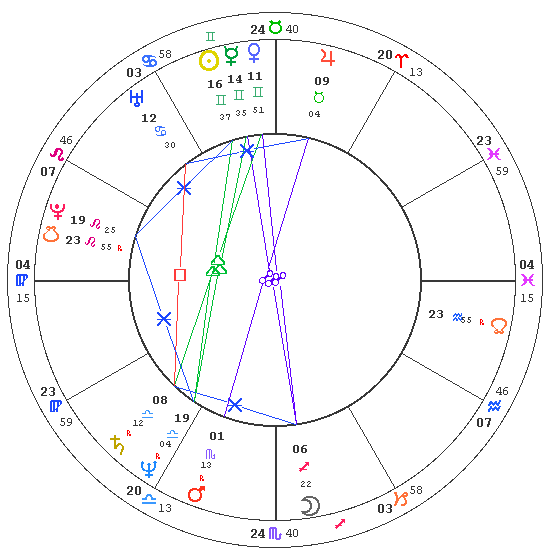 Taurus cooking (Top Chef host) and Sag is royalty – Hollywood royalty perhaps. Her birth time is 5pm – if it was just a few minutes before, a descendent of early degrees Aries would place Pluto in a precarious position. Pluto ruling death and Aries the head. With both Liam and Natasha having Sag moons, I think they met and married during some intense times. 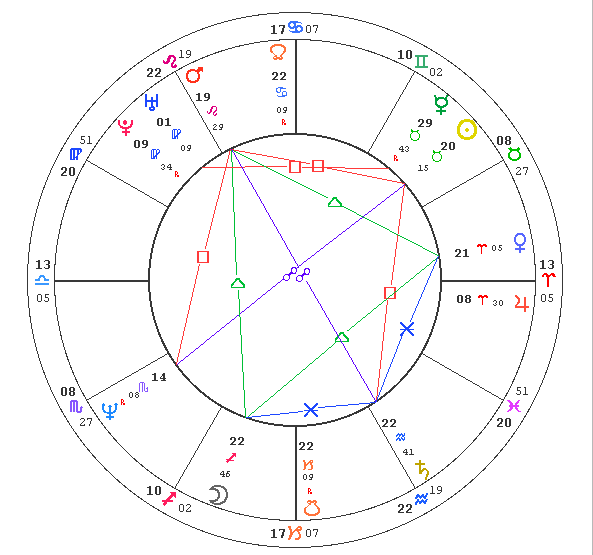 Poor Liam – he has south node conjunct Pluto. That’s past ways of working that no longer work and obsession. North node in Aquarius says that no matter how much Plutonic death and destruction is around, keeping calm, and above the situation like an Aquarian is the path to higher knowing. Easier when it’s an argument with the boss or at the traffic light than when it’s the loss of your spouse. My prayers go out to Liam and the boys.